My gardens in Strawberry Hill (my house, The Stables, was built later) were formerly part of the Twickenham Grange estate. Willow Grange replaced Twickenham Grange in the early nineteenth century extending from the area which is now Grange Avenue down to Popes Avenue; next door Gifford Lodge faced the Common (Twickenham Green). A record of previous owners of the estate dates back to 1697 and include the Blout family and the Prado family. Abraham Prado who lived in the house from the early 1760s was a well-known horticulturist and viticulturist; relics of his vines are still growing against the old walls surrounding The Stables with bunches of the black grapes overhanging Popes Avenue in the summer months. Horace Walpole, Prado’s neighbour in nearby Strawberry Hill House - the house which gave Strawberry Hill its name - recorded the fame of Mr Prado’s grapes in a letter to Lady Ossory in 1774. It seems that Prado gave the grapes to his neighbours including Horace Walpole. Walpole described the excitement at a dinner party when bunches of Prado’s grapes were concealed and then brought out as a surprise dessert. 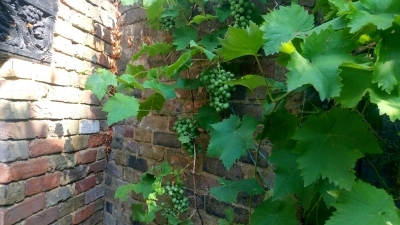 Mr Prado’s grapes seem to have been of great interest generally and Horace Walpole wrote that the Duke of Argyle made a visit to inspect them in situ. In the early twentieth century the Willow Grange estate which included the land currently occupied by The Stables, Willow Grange and Pope’s Court was owned by Joseph Montague Haslip. Following Haslip’s death the estate was bought by Edward Gregory-Carlton, an estate agent from East Twickenham. The Stables, a single room building built in 1820 at the same time as Willow Grange, was transferred by Edward Gregory-Carlton in 1952. Subsequently planning permission was given for a house which was added to the original building. Members of the Carlton family lived in Willow Grange and the extended Stables. A postcard addressed to Susan Gregory-Carlton, sent in 1955 from Curacao, was found in the kitchen of The Stables during renovations. Likewise, a letter to Mrs P A Carlton at the house from C. Gregory and Son Ltd in Chilwell, Nottingham was found, posted on 20 April 1955. Once the Carlton family moved away The Stables became an ordinary family house, separate from Willow Grange, but after all this time Abraham Prado’s ancient vines still grow against the old wall harking back to much grander times. Local Area, Gifford Lodge, Pope's Legacy, Walpole's Strawberry Hill House, Grand Neighbours - Richmond House.